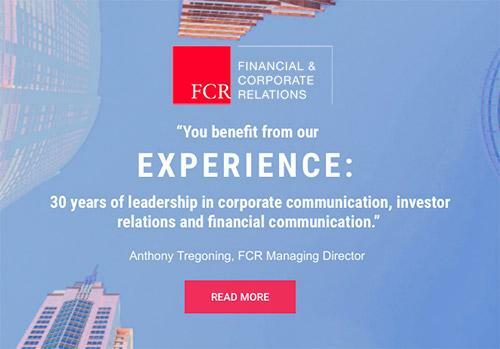 FCR (Financial & Corporate Relations) is a leading Australian corporate, financial, and investor communications company, founded in 1985, assisting about 50 clients throughout Australia to communicate with their stakeholders. They provide counsel and assistance to directors and senior management, combining skills in media and public relations, issues and crisis management, marketing, research, writing, graphic design, and online and print production. Their contacts with financial journalists, analysts, brokers and fund managers are second to none among communication consultancies. FCR had been with the same IT support company for some years, but when their needs changed it was time to find a new provider which could help them move with the times. They turned to iHelp IT in 2012 to provide quality technical support and service, to maintain and update their equipment, help their staff on an ongoing basis, and provide ongoing consultancy in all IT matters. An initial, free consultation identified a number of areas of improvement. iHelp IT identified key areas where the business could improve it's IT, reduce risks, and streamline it's business. Today, FCR enjoys a smooth, integrated IT environment, with continuous updates and monitoring. FCR rests easy in the knowledge that their IT services are in good hands, and their IT dollars are well spent. Their staff are able to call on iHelp IT's technical assistance without hesitation, knowing that having all their IT services under one roof means problems are quickly solved. With significant savings on services like internet and phone systems, FCR is able to direct funds towards improving their IT investment and strategically planning for future growth. Eastern Suburbs Anaesthetics comprises fourteen specialist anaesthetists who are all registered in NSW, and recognised by the NSW Specialist Recognition Board. All anaesthetists in this practice are highly qualified and skilled specialist doctors, having undergone extensive training. Eastern Suburbs Anaesthetics had migrated their office from Windows to Mac about 6 months before contacting iHelp IT. Their current IT provider, who had done the migration, had proven unable to maintain the office Macs in working order, and had difficulty doing simple things like removing unneeded software, despite multiple requests. The staff at Eastern Suburbs Anaesthetics felt the previous IT provider had over-promised and under-delivered. iHelp IT was brought on-board and Eastern Suburbs Anaesthetics immediately signed up to an iCare Managed Services agreement. iCare meant the staff could call iHelp IT with any support requests without fear of blowing a budget. Support is delivered first remotely, and then on-site if required, for one fixed monthly fee. iHelp IT quickly fixed the most pressing issues, and has maintained the Eastern Suburbs Anaesthetics office ever since. Eastern Suburbs Anaesthetics were so impressed with the iCare product that they renewed the initial agreement, and migrated the email hosting to iHelp IT. Recently, Easter Suburbs Anaesthetics migrated their on-premise PBX to an iHelp IT My Cloud Phones PBX, resulting in a saving of around 75% on their office phone bills. Highbury Partnership is one of Australia's leading independent financial advisers. They advise their clients on strategic and always highly confidential financial transactions, including recommending on takeovers, advising on the sale of assets, recapitalisations, IPOs, and mergers. About a year after starting in a serviced office, they needed more space, and needed their IT to move with them, and be much more secure. When Highbury Partnership moved their corporate offices from ServCorp to their own address, they needed an IT solution for themselves and for their subtenant. Due to the nature of their business and the sensitive work they do for their clients, security was a top priority, but they also needed flexible work arrangements. iHelp IT configured a Mac Mini server as the hub of their storage and security, and used the Mac OS Open Directory Architecture as the core of their security. Building on the Open Directory architecture of Mac OS X, and using the Kerio Control router, iHelp IT deployed WPA2 Enterprise WiFi security. This means that only authorised staff could access the wireless network, and each staff member had their own unique access, whether using a Mac or Windows PC. Staff could also work securely from anywhere in the world, allowing their team to work together no matter where staff were located. Highbury Partnership's subtenant was so impressed with the secure environment that iHelp IT implemented that they engaged iHelp IT to installed their network infrastructure as well. Both companies enjoyed very secure, high-speed internet, with staff able to access the company's critical resources securely, satisfying their business needs. Lightwell is a media design studio for museums and public spaces located in Chippendale. They make responsive environments for exhibitions and public spaces, and story-driven media for cultural institutions, mobile devices and the web. Michael Hill from Lightwell contacted us in mid 2014, after being referred by the Apple Store Broadway. They had significant IT infrastructure in place, but needed to integrate the security of their existing IT systems in order to bid on a large contract for a leading multi-national in the financial services sector, where security was of high concern. iHelp IT implemented Apple’s Mac OS X Server, using Open Directory as the core of the security measures. The existing Kerio Control router’s VPN, the Apple Airport Extreme’s WPA2 Enterprise network (via RADIUS), and access to the various Synology NAS devices were all configured to authenticate against Mac OS X’s Open Directory. Additionally, the guest wifi network was configured to only allow access to the internet. Access to network resources and data on servers were secured using a single directory, ensuring staff had to authenticate with their own account to access these resources, and allowing Lightwell to centrally manage security. The solution allowed Lightwell to satisfy their client of the security of their infrastructure, and they won the contract. We saw many things at the Genius Bar, but the one thing which consistently amazed me was the number of times people didn't back up their devices, whether Mac or iPhone. In fact, the only time someone cried (literally) at the Genius Bar was when the Mac owned by a young couple had a failed hard disk. The couple didn't have a backup, and consequently they lost every precious photo they'd taken of their baby's first year! What do you do in such a situation? There was nothing we could do but hand over a box of tissues. Fast forward to a day in the future when you too lose all the photos on a device. I'm not saying this scenario may happen, I'm saying that in all likelihood this scenario will happen. There are a myriad reasons. Phones get stolen, are dropped in the ocean, are forgotten on a train in a foreign city. Your ex could make off with your iPhone. Your roommate could make off with your iPhone. Your ex and your roommate could make out and then make off with your iPhone! And then everything on that iPhone which wasn't backed up is gone. Forever. Apple, as the inventor of the smartphone, has looked into it's crystal ball to see this day, and has you covered. All you have to do is take advantage of what's available. So let's revisit how to back up your iPhone. Firstly, some data doesn't need to be backed up separately. If you have your calendar, contacts, notes, reminders, and email in the cloud then your data is automatically synchronised, and in the event you need to replace your phone that information can be synchronised with your new phone in just a few minutes. But what about everything else? Your game progress? Your Skype login? Your FaceBook account? And, more important than all of those - your photos! Most people know that backing up their iPhone to their Mac or PC can be done via iTunes, but this only happens when you're on the same wifi network, and when your computer is on and iTunes is running. In some cases this is further restricted to happen only when your iPhone is physically connected to your computer. But when you're out and about - the times you're most likely to be taking family snaps - your computer is nowhere near you. If you're on holidays it could be weeks before you get back to your computer! Apple has a number of solutions to this, and they all assume you have an iCloud account. If you have an Apple ID (for the iTunes or App Store) then use that to sign in to iCloud. Once you've setup your iCloud account on your iPhone you're ready to use one of Apple's backup solutions. Important: Backups only happen when your iPhone is plugged into power, locked, and connected to wifi; use a hotspot or your hotel wifi when on vacation. Important: Photos will upload via both wifi and cellular data, so be aware of any cellular data charges (especially when overseas). To enable or disable cellular data for Photos go to Settings > Mobile > Mobile Data on your iPhone. Important: Uploads only happen when your iPhone is connected to wifi; use a hotspot or your hotel wifi when on vacation. Follow this guide and you should never need a box of tissues because you've lost your photos. For the full Apple support document on backing up, go here or contact iHelp IT.